We woke up Saturday and headed to the track to get everything unloaded and ready for the next qualifier which by the way was to be our final qualifier as there just wasn't enough time to get Two more qualifiers and first round of eliminations in. Having some extra time on my hands, I wandered over to team Midnight's pit to see what was going on. Jeff from the NMCA was there and he asked why didn't we claim the record yesterday? I must of looked confused to him as I didn't know that was the rule for setting records. Well no use crying over spilled milk so I figured if we did it once we could do it again. I headed back to our pit annd informed Chris that our record pass was not one offically and informed him of the rule. Some time passed and the call was made for our second and final qualifier. With it still being early in the day and that meaning good air, I left the tun-up the same and we made our way to the staging lanes. After making the pass and finding out the car ran 7.453, we knew we needed to find out why the car fell off. We got back to our pit and looked over all the data and made a change that thought would be the right direction. So with that being the end of qualifing, we were qualified number 1 and had round one to make before finishing up the day. We headed over to registration and found we had a bye first round. The call was made for first round so we towed up and got ready for our solo pass. The car ran a 7.381 and that was good enough for a record. Chris and I towed up to the scales and went thru the process of claming a record. We just now needed to back this pass up to make it offical. That ended the day Saturday so we loaded up and followed Susie and her husband Allen to the hotel to get something to eat. After hitting the buffet and having full bellies, we spent some time in the casino and headed up to our for some much needed rest. I don't mean to sell Chris out here but will anyway. I'm his big brother and am supposed to right? Anyway, the previous night at the hotel went something like this the very load snoring sound followed by the yelling of the name Chris by Colleen. Needless to say, I didn't get muchh sleep. So after 2 hours of the same thing Saturday night, I recommended Chris and I move his mattress to the bathroom and close the bathroom door. This work as I could barely hear Chris snoring and Colleen slept peacefully. We woke up Sunday morning and had a possible 5 more round of racing even after completing one round yesterday. Knowing wee needed our norishment, we picked up some donuts and headed for the track. For the last time this weekend, we unloaded the car and got ready for second round. This round we had Kenny Lafferty and I know he can make power so we had to be on our game. As Kenny and I were staged and lights came down, Kenny left first with an amazing .009 reaction time to my .022 light. Unfortunately, Kenny shook the tires as we walked away from him to an amazing 7.358 record setting pass, which is the quickest NPS pass ever recorded in competition. Looks like that <b>KP racing engines </b>power was making some steam. OK, so we made it past second round and needed to get ready for third round. This round would bring our EC1 chassis up against a very nice Skinny kid race car chassis. James Jarrett and his beautful 69 Camaro would have to go down for us to advance. This time we were the first to leave and never saw Jim as we ran a 7.437 to Jim's 7.528. So feeling good about going another round and looking forward to round 4 and the semi's, we would now be up against Dave Beeson and purple 74 Camaro. Dave had been running very well and spent some money over the winter updating his motor program. Dave had been as fast as 7.46 in a previous round, so he needed to be taken seriously. So 4 cars left and Dave and I completed our burnouts. AS I prestaged, I see Chris giving me the single sign followed by the broke sign. Looks like we were on a single. I final staged the car and tried to get after the tree. I left with a .024 light and clicked off a 7.483 pass to advance us to the final round. Danny Shemwell had just taken out Shawn Baker to advance him to the final round. Chris and I prepared the car and waited for the call for the finals. The call was made so Chris towed me up to staging where we met up with Danny. Ww wished each other luck and got in our cars. 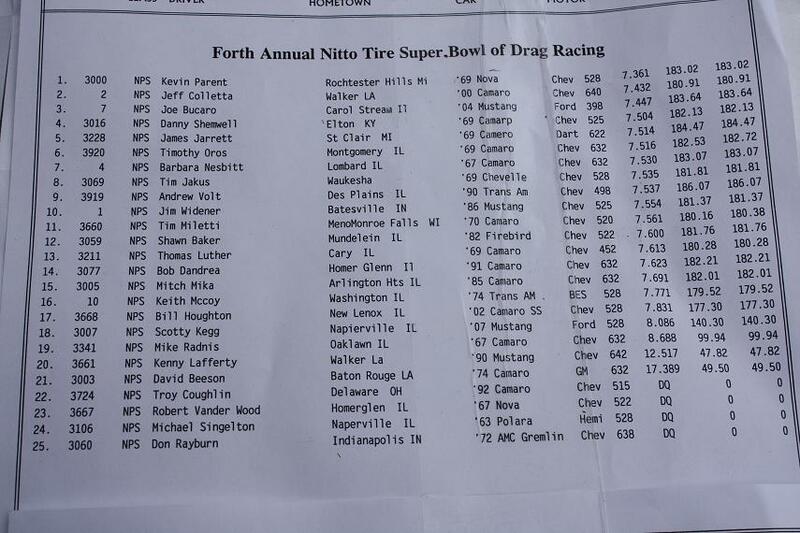 Here we were in the finals of the NPS class, at the NMCA/NMRA Joliet Superbowl event. Exactly where we wanted to be. We both final staged. Danny left a little early which gave him the red light and us our first Joliet event win.